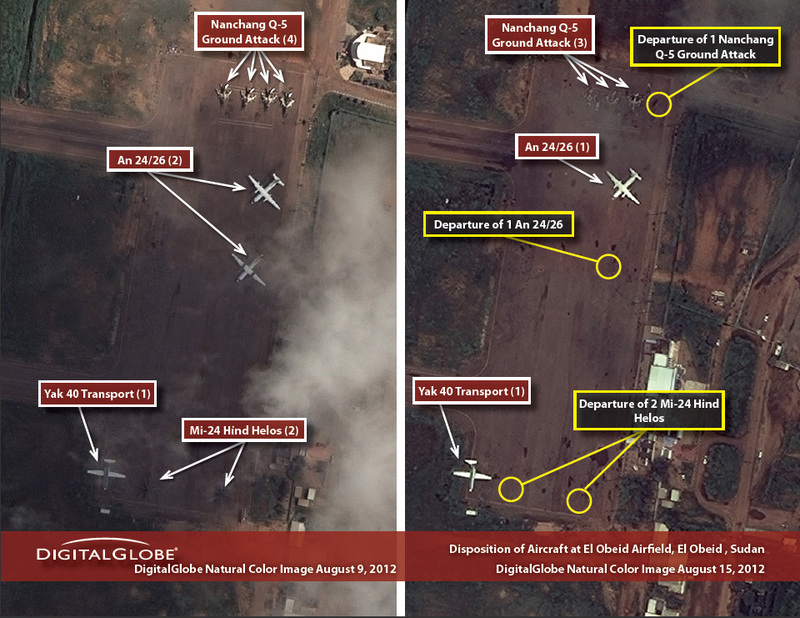 Aircraft like the Antonovs shown in this imagery are SAF’s weapon of choice and the primary means of civilian displacement in the Nuba Mountains. On August 8, 2012, the United Nations reported that around 655,000 people have been displaced due to fighting between the Sudan People’s Liberation Army-North, or SPLM-N, and SAF in South Kordofan and Blue Nile states since the conflict began in July 2011. Approximately 520,000 of the displaced are within South Kordofan alone, 350,000 of them coming from areas controlled by the SPLM-N. According to Sudan expert Eric Reeves, as of June 12, 2012, there have been 1,797 confirmed aerial attacks on civilians and humanitarians in Sudan and South Sudan by military forces of the current regime since it took power in a 1989 military coup. 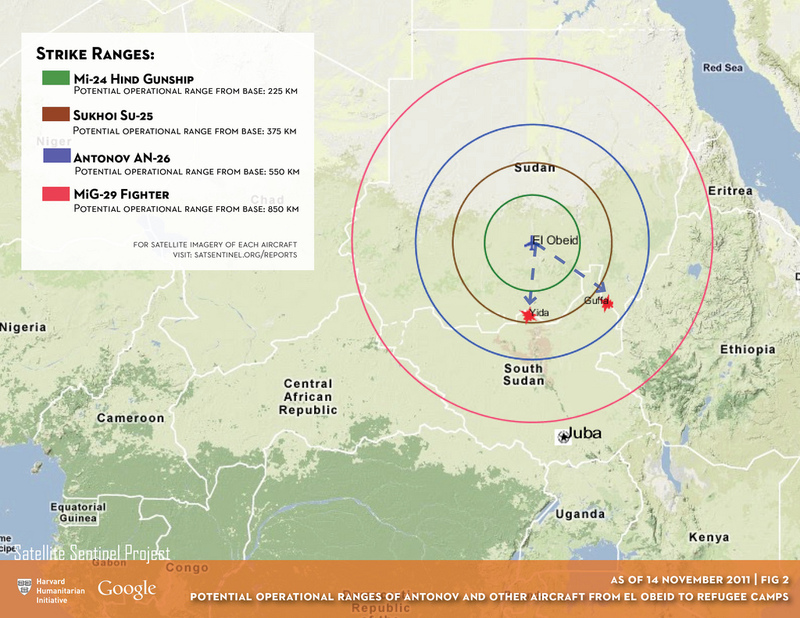 The Antonov AN-26 has a potential operational range of approximately 683.5 miles and an operational radius of 341.7 miles, putting Kadugli, the former capital of South Kordofan in the Nuba Mountains (160 miles from El Obeid), Yida refugee camp in South Sudan’s Unity state (215 miles from El Obeid), and Guffa camp in South Sudan’s Upper Nile state (282 miles from El Obeid) within easy striking range of the aircraft captured in this image. Sudan and the SPLM-N recently signed separate memoranda of understanding, or MOUs, with the U.N., the African Union, and the League of Arab States concerning the delivery of international humanitarian assistance to South Kordofan and Blue Nile. These MOUs provide for, among other things, a cessation of hostilities in the two states. SSP has not received any reports of recent attacks from either side; however we continue to closely monitor the border region. Download "Situation Report: Disposition of Aircraft at El Obeid Airfield." View and download full resolution imagery on Flickr.